I just about managed to break the 4,000 word mark this week, all on Glitch. The week was saved by a productive couple of hours on Saturday. We’d had a busy week with an Eddie Izzard gig on the Monday, a trip to see The Daisy Theatre on Friday and the 5km ‘Santa Shuffle‘ race on Saturday. 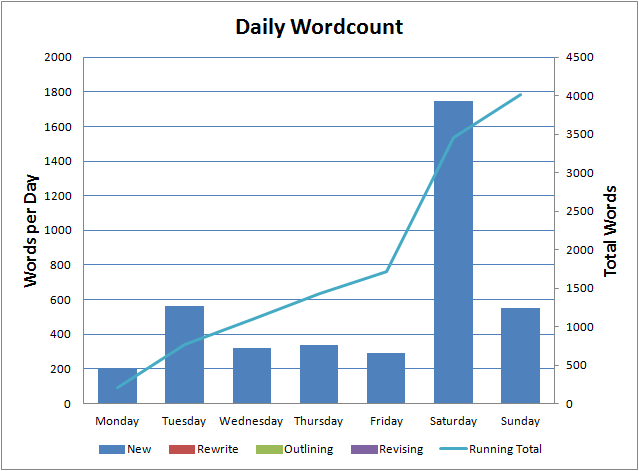 Still, I avoided setting a new weekly low and broke the 50,000 word barrier. There’s still another eight or so chapters to go but I’m still hoping to get the first draft finished before Christmas so that I can spend the break working on revisions of The Ghost Smuggler.